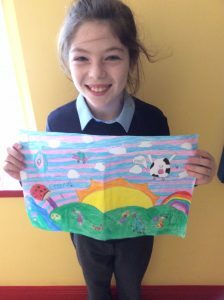 A big congratulations to Jasmine and Lyndsey who were winners in the recent Credit Union Art Competition. The standard of entries was very high and it was a wonderful achievement for both girls to receive prizes in this competition. Jasmine came 2nd in the 8-10 year category and Lyndsey came 2nd in the 11-13 year category. Well Done Girls!! Ms. Taylor and the Junior Room are extremely busy exploring the theme of the building site and ‘Houses and Homes’. We are very busy! We set up a building site in our home corner. We have a building site at the back of our school at the minute while our fantastic Multi Use Games Area is being constructed. We really enjoyed the presentation the landscaper Colin Delaney of Midland Landscaping and Sports gave to the whole school. He explained the stages in the construction of an astro turf pitch from foundation stage to completion. We have lots of future Engineers and Builders in Ballagh no doubt. The Senior room have photographed the timeline of the construction project. Thank you so much to our wonderfully committed and hardworking Parents Association who recently held a very successful Quiz night in Rattigans. They are always so busy fundraising for great things to benefit our school. Thank you to our local community who are so generous also. Food Dudes is a programme developed by the University of Wales, Bangor, to encourage children to eat more fruit and vegetables both in school and at home. It is based on positive role models (the Food Dudes characters), repeated tasting and rewards. It is ultimately designed to enable children to enjoy eating healthy diets, and to create a healthy eating culture within schools. Who are the Food Dudes? Phase 1 is an intensive intervention which lasts 16 days. During this time, children in the junior classes were given fruit and vegetables while they were read a letter and/or watched a specially designed DVD of the Food Dudes. These super-heroes save the life force from a gang of baddies whose objective is to take away the energy of the world by depriving it of nutritious fruit and veg. Each day the children were rewarded with stickers or small rewards and get a tick on the classroom wall chart for successfully eating the fruit and veg. This phase is primarily school based, although children keep a diary of fruit and veg they have eaten at home. The senior classes take part in 4 tasting days during phase 1, also get read a letter and/or watch a DVD episode and are rewarded with 4 rewards. We are currently working on Phase 2 . This aspect extends the home element of the Food Dudes programme by encouraging the children to bring their own fruit and veg to school every day in special Food Dudes containers Classroom wall charts continue to be used for the junior classes and are introduced to the senior classes to record progress and children receive Food Dudes certificates upon reaching goals. We hope this phase maintains fruit and veg consumption in the longer term. Why should we bother with our 5 a day rule? Are an important group of foods for health. They can help prevent certain diseases such as heart disease and certain cancers. Contain fibre as well as a whole range of beneficial vitamins and minerals such as vitamin C, the B vitamins, potassium and magnesium. Dark green vegetables like spinach and broccoli contain folate and vitamin E, while orange and red vegetables provide carotenes, a form of vitamin A. Also provide a wide variety of other substances called phytochemicals, flavonoids and phytonutrients which are thought to be protective. Fruit is fairly low in calories and contains no fat, and is a great choice for a snack between meals. To get all the goodness you can from fruit and vegetables choose a wide variety of colours and aim for 2 servings of fruit and 3 servings of vegetables every day. 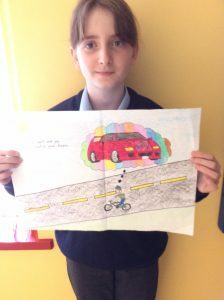 We monitor our modes of transport to school and we are currently working on the Environmental Review and Action plan for the Travel theme. We hope to hold some Action Days in the future and we have lots of exciting activities planned. We realise Climate Change is a serious issue that needs to be addressed by all nations. We are willing to make a contribution within our school and community. As part of our Curriculum and Greenschools work, we have completed fieldwork with the help of Jillian Banahan and Caitriona our Green Schools Travel Coordinator. Recently, we went on a wonderful walkability audit and SESE walk in the locality to assess where we might locate our park and stride location for our WALK ON WEDNESDAY initiative.